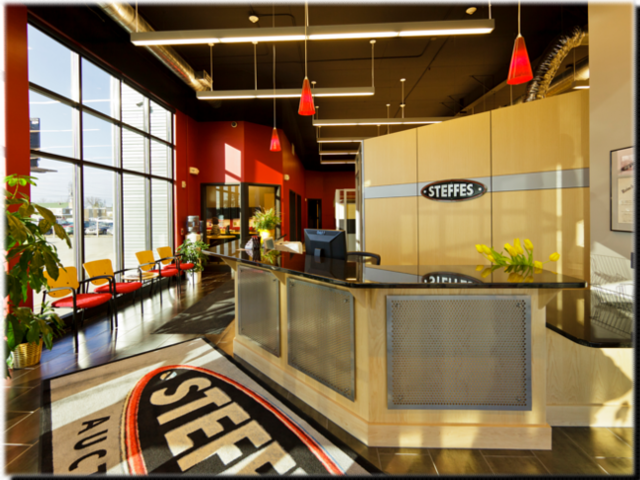 About - Steffes Group, Inc. Selling Land and the Equipment to Farm it Since 1960! Steffes Group, Inc. and its contributing divisions are primarily engaged in the liquidation and management of Ag related assets. Since 1960, we have been busy selling everything from the latest combines and tractors to tillable farm acreage to hay and livestock. Although our primary focus is Ag related, we also regularly sell and are readily able to market an array of assets like construction equipment, large estates, and an assortment of business holdings. Our company was founded in 1960 by Robert (Bob) Steffes who primarily performed farm and livestock auctions. In 1984 the business incorporated and moved all company operations to Fargo, North Dakota. From that time forward the company has experienced a continued growth pattern and an expansion of its service offerings. We now have locations in North Dakota, Minnesota, and Iowa. The large majority of our growth and success can be attributed to our long standing reputation as consistent performers who are genuinely true to our core values. 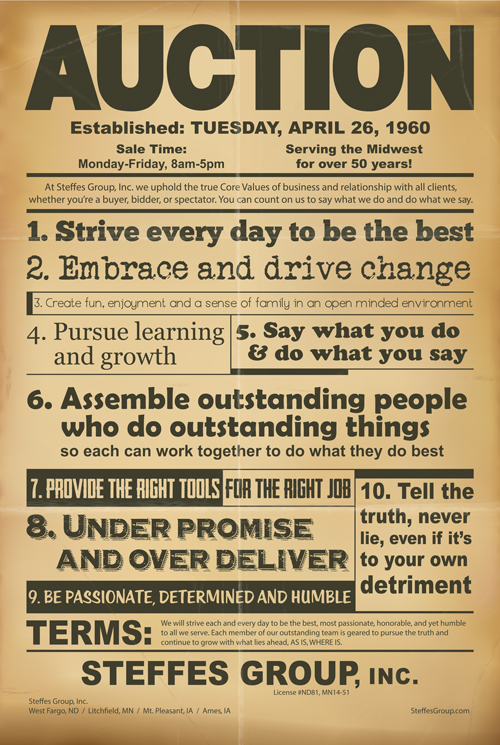 These core values are of the utmost importance to the team at Steffes Group because a company is only as good as its people. Accordingly, we seek to assemble outstanding people who do outstanding things so each can work together to do what they do best. In all endeavors, big and small, we will always be committed to provide our clients and customers outstanding service, professionalism, and most importantly honesty and integrity. Looking forward, we seek to continue to grow and prosper as a team of professionals. In doing so, we seek to be known as one of the nation’s largest agricultural services companies and be considered one of the best of the best.